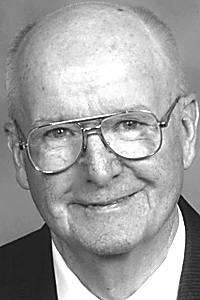 John A. Strittmatter, 90, Patton RD, died Sunday at UPMC Altoona, surrounded by his loving family. He was born in Ebensburg RD, son of the late Alexander and Mary Frances (Zeak) Strittmatter. On Sept. 10, 1949, he married Mary J. Farabaugh in St. Augustine. Surviving are his wife of 69 years, Mary J.; eight children: Jane A. (Robert) Stoltz, Jack P. (Rita Bender), Frank A. (Patty Bakale), Marie T. (Bill) Rhoades, Bernie J. (Tessie Friedhoff), Dave G. (Shirley Gailey), Susan M. (Ed) Friedhoff and Vicky E. (Kevin) Eckenrode; 30 grandchildren; and 41 great-grandchildren. He was the last member of his immediate family. He was preceded in death by two infant sisters: Margaret and Lucilla; infant brother, Clement; two brothers: Philip and Demetrius; and four sisters: Julia Jones, Ursula Strittmatter, Ellen Ferry and Rose Hilda Vetock-Strittmatter. John worked as a farmer and dairy farmer for over 60 years. He also worked in the coal industry and real estate for many years. He received the 2016 Family of the year Pro-Lifer Award and the 2018 Bishop Carroll Cornerstone Award. He was a life member of the NRA and a member of the Knights of Columbus, Ebensburg Council; the Pennsylvania Farmers Association; the Banner Grange, Ebensburg, and Pomona Grange, Cambria County, where he served as master for many years and the State and National Grange, where he was awarded the 2009 National Grange Award; Regional Aviation and Conservation and Recreational Association, Cambria County Conservation and Recreational Board; the Allied Milk Producers Association, where he served as president for several years; and member of the Holy Name Society and St. Augustine Catholic Church. John enjoyed attending his grandchildren’s sporting events and hunting. Friends will be received from 3 to 7 p.m. Tuesday, Sept. 11, 2018, at Gibbons Funeral Home, 1688 Liberty St., Ashville, where a Rosary will be recited Tuesday afternoon. A funeral Mass will be celebrated at 11 a.m. Wednes­day, Sept. 12, 2018, at St. Augustine Catholic Church, the Rev. Christopher Lemme, T.O.R. celebrant.